SKIT-SO--It’s one of those Mondays and you’re looking around for restaurant that’s open. Problem is you’re feeling like Sushi but the other side kissy face wants Mexican. Enter Juan Chou, a Juniper Street restaurant that many can’t decide if it’s in North Park or South Park. Call it Burlingame and be done with it. Juan and Chou (combo of names of the owners heritages) have opened (since September) a restaurant, where you can dine off of a terrific Japanese and Mexican menu. Early reviews have been mixed. But taste buds are different. Your review is equal to mine. I loved the concept and the food. Loved the sushi. Mexican side (carnitas) is better than most. Would I leave my ‘hood to find better Mexican cuisine? Honestly no, but, need to ask here why burritos from take out stands taste soooo much better than sit-down restaurants? Juan Chou comes close but doesn’t beat out Saguaro’s on 30th in North Park. I digress. Juan Chou is a fun and tasty dining spot well worth staying in or visiting the neighborhood. I’m coming back. The only downside of our visit was from four historians, who were overheard how much they miss El Camino Restaurant (extinct tenant before Juan Chou). Get over it. “Gee, Holden I liked your other girl friend better.” Cool, I liked you better before you opened your yap. 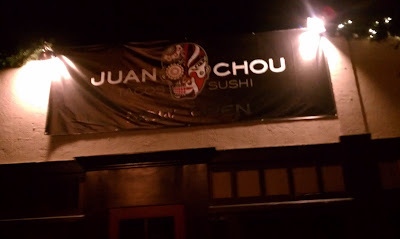 Juan Chou, 3023 Juniper St, (just east of 30th), (619) 487-0455.